Each week, "Uncle" Bill Adams would ask the young cast members of the show, "How do we travel to Let’s Pretend?" Then, one of the Pretenders would tell the host that they should go in a car, by train, or on a duck’s back. The suggestion would be followed by the sound of an engine, a whistle or a quack, and the cast and listeners alike would be whisked away. Once at their destination, young audiences were treated to a radio play based on a fairytale or a piece of classic children’s literature. Stories that were performed on the program included Cinderella, The Princess and The Pea, The Elves and The Shoemaker, Rumplestiltskin, Thumbellina, and Sleeping Beauty. 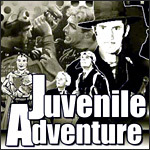 This award-winning program for children was broadcast on Saturday mornings on CBS for 25 years. Description: "If the job's too tough for you to handle, you've got a job for me."